ETH Zurich scientists have developed the smallest and cheapest equipment for detecting people by smell. It could be used in the search for people buried by an earthquake or avalanche. Trained rescue dogs are still the best disaster workers—their sensitive noses detect people buried by earthquakes or avalanches. Like all living creatures, however, dogs need to take breaks every now and again. They are also often not immediately available in disaster areas, and dog teams have to travel from further afield. 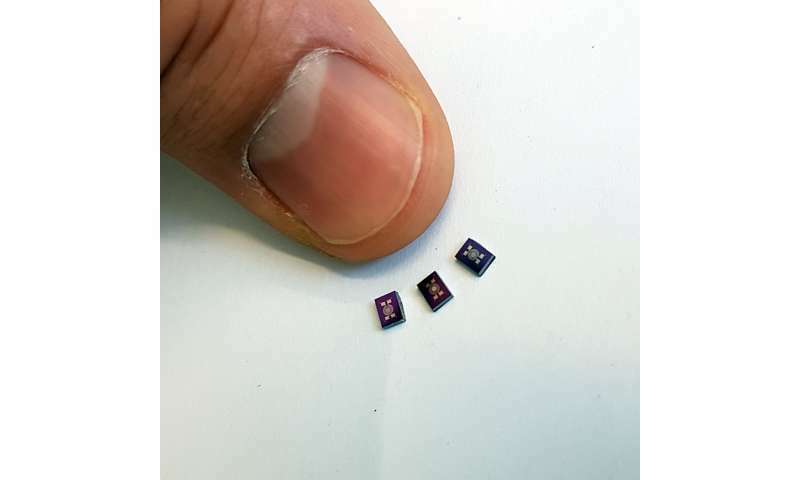 A new measuring device from researchers at ETH Zurich led by Engineering Professor Sotiris Pratsinis, however, is always ready for use. The scientists had previously developed small and extremely sensitive gas sensors for acetone, ammonia and isoprene—all metabolic products that humans emit in low concentrations via breath or through skin. The researchers have now combined these sensors in a device with two commercial sensors for CO2 and moisture. As shown by laboratory tests in collaboration with Austrian and Cypriot scientists, this sensor combination can be quite useful when searching for trapped people. The researchers used a test chamber at the University of Innsbruck's Institute for Breath Research in Dornbirn as an entrapment simulator. Volunteers each remained in this chamber for two hours. "The combination of sensors for various chemical compounds is important, because the individual substances could come from sources other than humans. CO2, for example, could come from either a buried person or a fire source," explains Andreas Güntner, a postdoc in Pratsinis' group and lead author of the study, published in the journal Analytical Chemistry . The combination of sensors provides the scientists with reliable indicators of the presence of people. The researchers also showed that there are differences between the compounds emitted via breath and skin. "Acetone and isoprene are typical substances that we mostly breathe out. Ammonia, however, is usually emitted through the skin," explains ETH professor Pratsinis. In the experiments in the entrapment simulator, the participants wore breathing masks. In the first part of the experiment, the exhaled air was channeled directly out of the chamber; in the second part, it remained inside. This allowed the scientists to create separate breath and skin emission profiles. The ETH scientists' gas sensors are the size of a small computer chip. "They are about as sensitive as most ion mobility spectrometers, which cost thousands of Swiss francs and are the size of a suitcase," says Pratsinis. "Our easy-to-handle sensor combination is by far the smallest and cheapest device that is sufficiently sensitive to detect entrapped people. In a next step, we would like to test it during real conditions, to see whether it is suited for use in searches after earthquakes or avalanches." While electronic devices are already in use during searches after earthquakes, these work with microphones and cameras. These only help to locate entrapped people who are capable of making themselves heard or are visible beneath ruins. The ETH scientists' idea is to complement these resources with the chemical sensors. They are currently looking for industry partners or investors to support the construction of a prototype. Drones and robots could also be equipped with the gas sensors, allowing difficult-to-reach or inaccessible areas to also be searched. Further potential applications could include detecting stowaways and exposing human trafficking.